Within organisations the situation is not dissimilar. The term organisational ambidexterity was first coined by Professor Robert Duncan in 1976. Typically, organisational ambidexterity refers to the ability of an organisation to balance exploration and exploitation equally well. Again, this is not an easy skill to master—tension exists between these two “fundamentally different learning activities” and each places different demands upon an organisation. An organisation’s ability to exploit its existing resources and competences hinges upon its ability to align itself around a clear strategy and to implement this strategy effectively. Competitive advantage is created by effectively and successfully exploiting the organisation’s existing competences and resources. Within the organisation, a laserlike focus on maximising returns results in a fearsome ability to implement and execute plans. Operational excellence is driven throughout—if improvements and refinements can be made, they will be made. The organisation functions like a well-oiled machine. An organisation’s ability to seek out new opportunities and adapt to changing environments is determined both by its openness to the broader environment and its willingness to take risks. Competitive advantage is created by uncovering new opportunities through exploration and innovation—particularly innovation that is discontinuous and potentially disruptive. The organisation creates room for diversity and discovery, both internally and externally. Staff are encouraged to experiment and play. Risks are taken that increase the potential for game changing outcomes. Understandably, just as it is difficult to write equally well with both hands, organisations frequently find it difficult to achieve balance between exploration and exploitation. Based upon my own experience and academic organisational ambidexterity research, I’ve devised a matrix that categorises organisations in one of four different ways. Do you recognise your organisation below? Also known as ‘the walking dead’, zombie organisations fail at both exploration and exploitation. By not effectively exploiting the resources they have at their disposal and neglecting to maintain their current capabilities, they become less and less effective over time. In addition to this, they fail to explore and adapt to their changing environment, resulting in their already weak proposition becoming even less in demand as markets shift. To begin with, the organisation continues to exist thanks to their historical success and latent demand. However, these organisations are living on borrowed time and without significant action will, at some point, cease to be viable concern. Conquerors are truly ambidextrous organisations: they maximise their returns from their existing resources and competences, while simultaneously ensuring they explore and adapt to the changing environment. By placing high value on both organisational effectiveness and organisational responsiveness, these organisations have the ability to both explore new opportunities and exploit the opportunities they find. The organisation places themselves in the best possible position to survive and thrive, maximising current gains whilst ensuring that the organisation remains flexible and well able to cope with expected and unexpected changes. Ideally, we all want to be conquerors but ambidexterity is not an easy skill to master nor is it necessarily a fixed state. 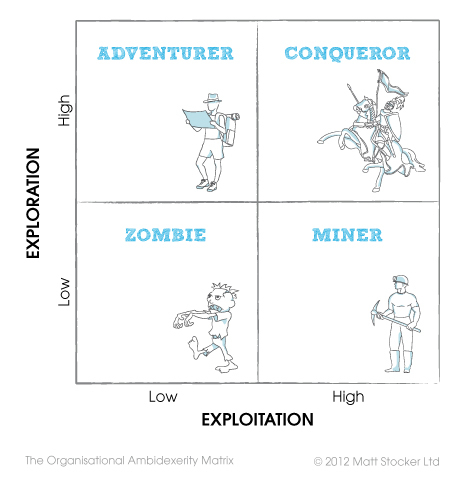 Start-ups are likely to begin as adventurers, looking for opportunities to exploit. As their ideas begin to develop and stabilise, they may move into being a miner, exploiting the competences and resources they cultivated to maximise gains from the opportunity they have discovered. Similarly, organisations with a long-standing heritage that have been comfortable as miners for years may find themselves rudely awoken by the competition. This may then lead to a mad dash to adventure in a bid to stay alive. In either circumstance, the abilities to both explore and exploit need to be mastered—even if not simultaneously. If a start-up never develops an ability to implement and exploit, no matter how brilliant their idea, business failure is likely to result at this early stage. In the same way, no matter how good an organisation is at exploitation, one day change will be required to stay in the game. The real skill of the conqueror therefore is balancing the two skills as required. Knowing when to send your people out and when to solidify your current position. And when you have the capacity to do both at the same time. Creating an ambidextrous organisation requires organisational awareness and commitment. Becoming a conqueror won’t just happen by accident! Just as becoming a concert pianist doesn’t happen overnight but requires hours of practice to strengthen and hone the skill of the less dominant hand, ambidexterity requires intentional design and development. Creating a truly ambidextrous organisation requires self-awareness and management awareness, a dedication to excellence and a willingness to take risks, all in the pursuit of building something great. Birkinshaw, J. & Gibson, C. (2004). Building ambidexterity into an organization. MIT Sloan Management Review, 45(4): 47-55. Boumgarden, P., Nickerson, J. & Zenger, T.R. (2012). Sailing into the wind: exploring the relationships among ambidexterity, vacillation, and organizational performance. Strategic Management Journal, 33: 587-610. March, J.G. (1991). Exploration and exploitation in organizational learning. Organization Science, 2(1), 71-87. Raisch, S. & Birkinshaw, J. (2008). Organizational ambidexterity: antecedents, outcomes, and moderators. Journal of Management, 34(3): 375-409. Hello, I found this matrix very useful, really as it makes the Ambidexterity a more operational concept. I am a strategic consultant and business school lecturer and I am intensively researching in Ambidexterity with the aim to connect the academic research with a practice management program and to a consulting product. I would be interested in being in contact if you are as well working in the same direction. Alvaro, thanks so much for your comment and for your kind feedback. Really glad that you’ve found the matrix useful. It does sound very much as though we’re working in the same direction and it would be great to connect. Will drop you an email shortly.